Two goals apiece from Jordan Rhodes and Benik Afobe helped Huddersfield thrash Rotherham and move into the area semi-finals of the Johnstone's Paint Trophy. Rhodes' curling shot made it 1-0 but Ryan Taylor equalised, steering home from a corner, before Rhodes tapped in. Arsenal loanee Afobe headed in a third and he then set up Scott Arfield, who made it four with a composed finish. Afobe scored again after a Joe Garner pass, although Rotherham grabbed a late goal with Ryan Cresswell's header. "It was going to be tough, we knew that, but it makes it even tougher when you concede after 30 seconds. That makes it an awful lot harder. "We need to get back to the basics. The defending is so poor it's untrue. We are conceding too many goals"
"I thought attacking-wise there were some exceptional bits of play, though I was very disappointed with the two goals we've given away from set-plays, and it's important we talk about these things even in a good win. "We could have scored seven or eight goals, but the two goals we gave away were very, very poor so that's something we'll be looking at in the coming days. 90:00+3:04 The final whistle is blown by the referee. 90:00+1:20 Stephen Brogan takes the inswinging corner, Stephen Brogan provided the assist for the goal. 90:00+1:20 GOAL - Ryan Cresswell:Rotherham 2 - 5 Huddersfield A goal is scored by Ryan Cresswell from close range to the top left corner of the goal. Rotherham 2-5 Huddersfield. 88:49 Paul Warne fouled by Jamie McCombe, the ref awards a free kick. Strike comes in from Nicky Law from the free kick. 88:37 Damien Johnson takes a shot. Jamie Annerson makes a comfortable save. 86:32 Scott Arfield is flagged offside by the assistant referee. Jamie Annerson takes the indirect free kick. 84:18 Mark Bradley has an effort at goal from outside the penalty box missing to the wide left of the goal. 83:18 Mark Bradley produces a right-footed shot from outside the penalty box and misses wide left of the target. 80:35 Substitution Lee Croft replaces Joey Gudjonsson. 79:31 Shot from outside the box by Nicky Law goes wide right of the target. 78:35 The ball is crossed by Gary Roberts. 76:42 Substitution Gary Roberts on for Graham Carey. 71:49 The assist for the goal came from Jamie McCombe. 71:49 GOAL - Benik Afobe:Rotherham 1 - 5 Huddersfield Benik Afobe finds the back of the net with a goal from inside the penalty area low into the middle of the goal. Rotherham 1-5 Huddersfield. 68:28 Substitution Joe Garner comes on in place of Jordan Rhodes. 67:39 Paul Warne has an effort at goal from outside the box which goes wide right of the goal. 67:04 The ball is delivered by Mark Bradley. 65:44 The referee gives a free kick against Joey Gudjonsson for handball. Stephen Brogan takes the free kick. 63:49 Substitution Jason Taylor goes off and Mark Bradley comes on. 63:01 Benik Afobe produces a right-footed shot from inside the area that clears the bar. 61:52 Corner taken by Graham Carey played to the near post, save made by Jamie Annerson. 60:04 Jordan Rhodes produces a cross, Effort from inside the six-yard box by Scott Arfield goes wide left of the target. 59:03 Corner taken by Stephen Brogan from the right by-line, clearance made by Jamie McCombe. 57:29 Stephen Brogan produces a left-footed shot from inside the area that clears the crossbar. 57:12 Stephen Brogan decides to take a short corner. 56:54 The ball is sent over by Nicky Law, save by Ian Bennett. 56:16 Centre by Graham Carey, comfortable save by Jamie Annerson. 54:52 Paul Warne has an effort at goal from just inside the box that misses to the left of the goal. 54:01 Outswinging corner taken by Graham Carey from the left by-line, clearance made by Nick Fenton. 51:53 Assist on the goal came from Benik Afobe. 51:53 GOAL - Scott Arfield:Rotherham 1 - 4 Huddersfield Goal scored by Scott Arfield from deep inside the penalty box to the bottom right corner of the goal. Rotherham 1-4 Huddersfield. 50:01 Inswinging corner taken by Stephen Brogan, Headed effort from inside the area by Luke Ashworth misses to the left of the goal. 49:14 Centre by Stephen Brogan, Joey Gudjonsson makes a clearance. 48:29 Liam Ridehalgh gives away a free kick for an unfair challenge on Stephen Brogan. Nicky Law crosses the ball in from the free kick, clearance by Antony Kay. 47:29 Corner taken left-footed by Stephen Brogan from the right by-line, Luke Ashworth produces a header from deep inside the six-yard box that clears the crossbar. 47:21 Nicky Law crosses the ball, clearance made by Jamie McCombe. 46:28 Shot on goal by Ryan Cresswell from long range goes harmlessly over the target. 45:01 The referee blows his whistle to start the second half. 45:01 Substitution (Rotherham) makes a substitution, with Paul Warne coming on for Ryan Taylor. 45:00+2:27 The ref blows to signal half-time. 45:00+1:35 Graham Carey has an effort at goal from 30 yards. Save by Jamie Annerson. 38:46 Tom Pope challenges Antony Kay unfairly and gives away a free kick. Indirect free kick taken by Ian Bennett. 38:22 Jamie McCombe gives away a free kick for an unfair challenge on Ryan Taylor. Free kick crossed left-footed by Stephen Brogan from left wing, clearance by Antony Kay. 37:11 Jordan Rhodes has an effort at goal from deep inside the area missing to the left of the goal. 36:17 Corner taken right-footed by Joey Gudjonsson, Ryan Cresswell manages to make a clearance. 35:34 A cross is delivered by Nick Fenton, Jamie McCombe manages to make a clearance. 35:25 Centre by Jamie Green. 34:16 Joey Gudjonsson fouled by Marcus Marshall, the ref awards a free kick. Free kick taken by Antony Kay. 30:55 Graham Carey takes a corner. 30:13 Effort from a long way out by Nicky Law goes wide right of the target. 27:15 Assist by Jordan Rhodes. 27:15 GOAL - Benik Afobe:Rotherham 1 - 3 Huddersfield Benik Afobe finds the back of the net with a headed goal from close in. Rotherham 1-3 Huddersfield. 26:26 Scott Arfield concedes a free kick for a foul on Jamie Green. Indirect free kick taken by Jamie Annerson. 26:17 The ball is delivered by Graham Carey. 24:48 Outswinging corner taken by Nicky Law. 22:35 Graham Carey provided the assist for the goal. 22:35 GOAL - Jordan Rhodes:Rotherham 1 - 2 Huddersfield Jordan Rhodes scores a goal from close in to the bottom right corner of the goal. Rotherham 1-2 Huddersfield. 21:57 Shot from just outside the box by Jordan Rhodes goes over the target. 18:12 Substitution Luke Ashworth is brought on as a substitute for Johnny Mullins. 17:39 Tom Pope is flagged offside by the assistant referee. Antony Kay takes the indirect free kick. 15:56 The assistant referee flags for offside against Tom Pope. Ian Bennett restarts play with the free kick. 15:17 The official flags Ryan Taylor offside. Ian Bennett restarts play with the free kick. 14:41 Effort from outside the penalty area by Joey Gudjonsson goes wide left of the goal. 13:23 Free kick awarded for an unfair challenge on Liam Ridehalgh by Marcus Marshall. Free kick taken by Graham Carey. 10:14 Outswinging corner taken from the right by-line by Nicky Law, Nicky Law provided the assist for the goal. 10:14 GOAL - Ryan Taylor:Rotherham 1 - 1 Huddersfield Ryan Taylor fires in a goal from inside the penalty box to the top right corner of the goal. Rotherham 1-1 Huddersfield. 8:42 Jordan Rhodes fouled by Ryan Cresswell, the ref awards a free kick. Graham Carey has a direct shot on goal from the free kick, blocked by Johnny Mullins. 6:23 The assistant referee flags for offside against Jordan Rhodes. Indirect free kick taken by Ryan Cresswell. 3:25 Benik Afobe is caught offside. Jamie Annerson takes the free kick. 0:22 Graham Carey provided the assist for the goal. Foul by Antony Kay on Stephen Brogan, free kick awarded. The ball is crossed by Nicky Law, Tom Pope has a headed effort at goal from deep inside the area missing to the right of the goal. 0:22 GOAL - Jordan Rhodes:Rotherham 0 - 1 Huddersfield Jordan Rhodes gets on the score sheet with a goal from the edge of the area to the top right corner of the goal. 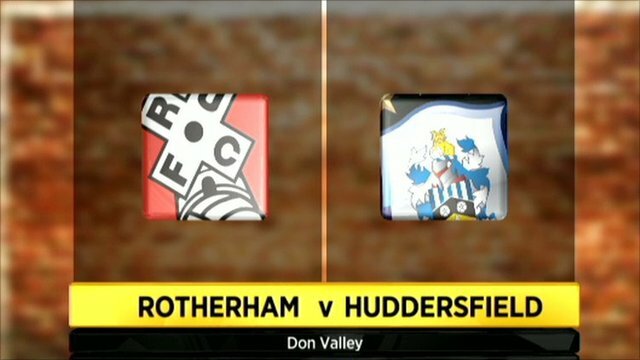 Rotherham 0-1 Huddersfield.